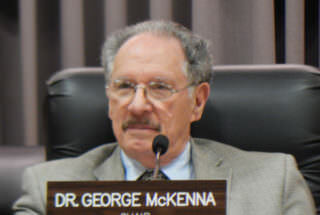 George McKenna is known for waxing eloquently during the school board meetings, and at the meeting on Sept. 12, he wrote down some of his thoughts. Part of the reason was because the new board President Ref Rodriguez is limiting statements to five minutes per topic by each of the board members, but part of it is because McKenna wanted to put down his thoughts about his philosophy of schools, and charter schools in particular. He read this before discussing the reauthorization of some charter schools on the agenda. I would like to make a general statement regarding the renewal of the charter schools on our agenda today. My concerns are that all of them demonstrate that 50% or more of their students do not meet the state SBAC academic standards. In one of the schools, 75% of the students did not meet standards in ELA. They are recommended for renewal because of the “comparison” basis that schools that are similar in demographics or the students’ home school is performing at the same level or worse. I challenge the Board to adopt higher standards for all schools, charter and traditional. We should not tolerate low performing schools-charter or traditional. Our business is to fix our schools and do the best for all children. If we are putting children first, we should not accept any school that is failing our children. We must encourage and help more charter schools and traditional schools to take up this challenge of turning around low-performing schools and helping the students they serve get back on the path to achievement. The Public Charter Schools Program was created to provide a structure where we could experiment with models of excellence and teaching and learning techniques, without the same rules and guidelines of traditional schools. An environment of innovation was developed to foster creativity where statutory barriers to accomplishing this purpose have been removed. Together, as a Board, we should not be considering the minimal level of academic success as an acceptable practice. I’m not convinced we simply need more “choices” in public education. We do need great public schools in every community. We don’t really have any choice at all if our local public schools and our charters are not high quality options. The idea of “choice” is very American, and it’s also at the heart of modern democracy. This free market ideology has turned parents into consumers, beyond being public citizens participating in a common good. Markets do a fine job making and selling things, but they also can create extreme inequality, with winners and losers. I don’t begrudge any family that makes the personal choice to send their child to any school, whether private, religious, charter, or magnet. I’m not advocating the elimination of choices. Choice alone doesn’t guarantee quality and change doesn’t always equate to improvement. Neither will solve the larger problems facing public education until we ensure that there are no underperforming schools, anywhere. As elected officials, that is our choice.